Bass Pro Shops of the Finger Lakes at the Finger Lakes Mall in Auburn, New York. 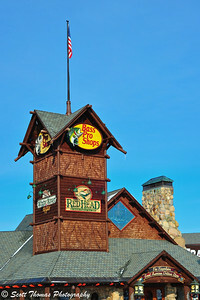 Bass Pro Shops are considered in the retail industry to be destination stores. Thereby, people will travel from all over a region to shop there. They are also places where people traveling will make a point of stopping to shop. So, you can imagine, when Bass Pro Shops announced they were looking for a location in upstate New York, the competition to land them was fierce. They choose the Finger Lakes Mall in the small city of Auburn, New York which is located near the shores of Owasco Lake and in the heart of the Finger Lakes tourism area. A place where outdoor sports enthusiasts could easily get to when visiting upstate New York. 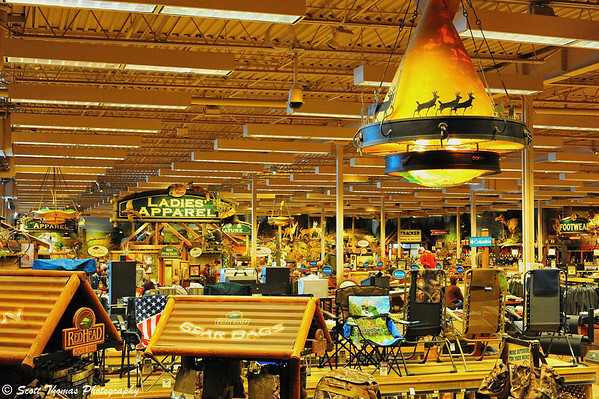 Sportsmen and women can find anything regarding fishing, boating, hunting, camping, hiking, kayaking, nature gifts and just about any other outdoor sport you can think of in the huge super store. Inside the Bass Pro Shops super store of the Finger Lakes at the Finger Lakes Mall in Auburn, New York. Nikon D700/50mm, 1/40s, f/8, ISO 6400, EV +0.7. If you are a member of PETA or do not like to see taxidermed animals or trophies hanging on walls above you, then this is not the store for you. It is decorated like a hunting and fishing lodge would be in New York’s Adirondack mountains. 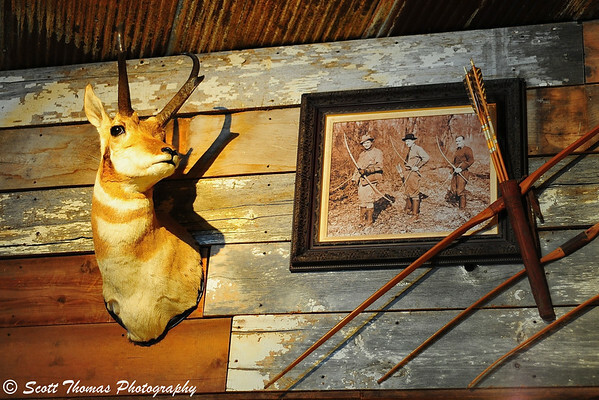 A pronghorn trophy hangs in the archery hunting department of the Bass Pro Shops of the Finger Lakes at the Finger Lakes Mall in Auburn, New York. Nikon D700/50mm, 1/60s, f/1.8, ISO 400, EV 0. I asked and received permission to photograph in the Bass Pro Shops of the Finger Lakes. Taking advantage of my Nikon D700 digital SLR camera‘s ISO capabilities and the Nifty-Fifty, Nikon 50mm f/1.8D, lens, I found a lot of interesting subjects. Like this mannequin which I thought belonged more in an Abercrombie & Fitch store. Wonder if it got delivered here by mistake? 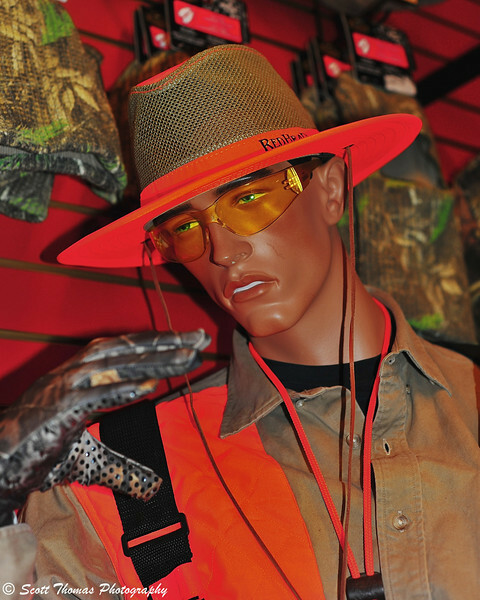 This mannequin is sporting the latest style in Hunter Safety Orange at the Bass Pro Shops of the Finger Lakes at the Finger Lakes Mall in Auburn, New York. Nikon D700/50mm, 1/60s, f/3.5, ISO 200, EV +0.7, pop-up flash at -1.0 power. Of course, with Dad looking so spiffy, the kids must be indoctrinated into the outdoor sports lifestyle with their own stylish outfits. I would be concerned about losing sight of them in the woods. Wouldn’t you? 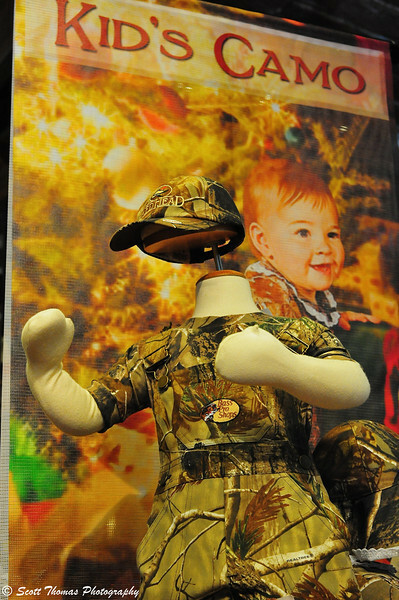 Kid's Camo display in the Bass Pro Shops of the Finger Lakes at the Finger Lakes Mall in Auburn, New York. Nikon D700/50mm, 1/60s, f/8, ISO 5000, EV 0. As I was leaving I could not help but notice something every rustic camp needs to go with the worn and comfortable furniture: Giant Fish Pillows! 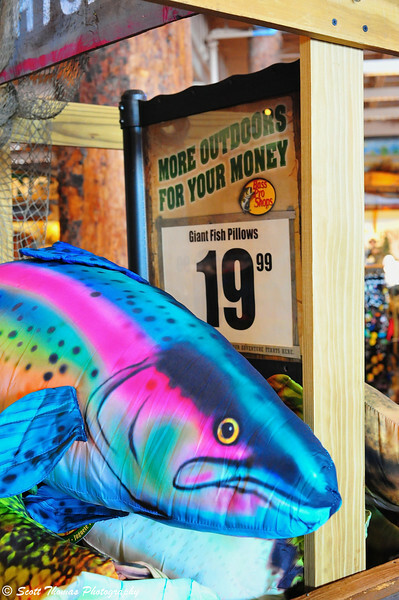 Giant Fish Pillows for only $19.99 for sale in the Bass Pro Shops of the Finger Lakes at the Finger Lakes Mall in Auburn, New York. Nikon D700/50mm, 1/60s, f/8, ISO 3600, EV +0.7. If you are passing by one of these Bass Pro Shops and enjoy the outdoors, I would hardily recommend taking the time to stop by. Remember to bring your camera! This entry was posted in Sports, Weekly View and tagged 50mm, auburn, bass pro shops, camping, finger lakes, fishing, hunting, mall, new york, nifty fifty, nikon D700, outdoor, shopping, store. Bookmark the permalink. Cute post, Scott! Reminds me of LL Bean in Maine. My ears are pinned back in wonder and amazement. Your shot of the deer on the wall reminded me of a shot this summer that I could NOT bring myself to take/make at a flea market. I came across five such deer heads in a cluster on the apshalt at the side of a vendor’s tables. I focused several times, tried several angles, explored the various compositons –and then could not click. Might have been the effect of all those fake eyes…..